Some college football players might get intimidated by more highly-regarded athletes. Antonio Brown is not one of those players. The multi-tasking specialist helped Central Michigan win its second MAC championship in three years, then led them to a win in the GMAC Bowl with over 400 all-purpose yards. Pairing with senior quarterback Dan LeFevour this past season upped Brown’s status (see the highlights below), along with a solid combine performance (4.5-second 40-yard dash, 4.1-second 20-yard shuttle). Brown had nothing but praise for the Chippewas, starting with the quarterback and concluding with the school that gave him a chance to shine and the confidence to declare early for the draft. I wanted to start out by asking what for some people might be a difficult question, but for you, not so much. If you were starting a team and you had a choice between Tim Tebow and Dan LeFevour, who would you pick? I’d go with Dan LeFevour. There you go. That’s what I thought. What sets him apart? Why do you think he was so successful at Central Michigan? I think he’s a great leader, and I think he just helps out everybody around him, you know what I mean? He works hard; he’s really smart, and I think he just takes care of business. How would you describe the offense there? We run a spread offense. You know, four to five wide (receivers), three wide, and we spread the ball around. We’re a shotgun team. We do a lot of quick gains, and we do a lot of route concepts. And were you mostly in the slot? Yeah, I was mostly in the slot. How do you think that benefited you? It benefited me a lot. I mean, going against nickelbacks, having to work linebackers and working up on safeties, being that I’m a quick guy and a speed guy, I caught 100 balls almost every year. You know, I think it really helped me. At what point in your career did you feel like the offense really started clicking? I think the offense was working at its best, really, last year. I mean, we beat so many good opponents. We beat Michigan State. We just were working together. Every year we got better and better. You can see this year, I think our numbers were really good, and I think this past year was our best year. As far as the offense working together, I think we were rated high in the nation on total offense (37.6 ppg), and I think we were top five in ball control. Was your quarterback leaving part of – did that go into your decision to declare early? I mean, it played a little (into the) decision. Also, we had a coaching change, and being that I did so well for three years – I was the freshman of the year, I was the (second) player in NCAA history to be first-team kick returner, punt returner, and wide receiver. This past year, I was first-team punt return All-American. I mean, I caught 305 passes, and I’m getting a lot of accolades, and I think I’m ready. In terms of your returning, if you had to choose one: kicks or punts? I love both. I mean, however I get the ball, and however I know that 10 guys on the field got my back, anytime I get it I can go the distance. As long as I’m on the same page with my blockers and the special teams coordinator and the special teams team, however I can get the ball and be successful and help the team. This is a question I ask of punt returners, because it’s something so few of us ever do: What are two or three key things that you would tell somebody trying to return a punt? First of all, secure the ball. I mean, giving the ball to the ref is a successful return. Either making a fair catch or taking it to the house, the first thing you want to do is make sure you’re securing and catching every ball. And you just want to follow your schemes that your coaches, special teams, draw out to help the team be successful, because special teams is a game-changing team that can enhance the team and make a difference in the game. So just catch everything, and make sure you hand the ball to the ref, (whether) that’s scoring or catching a fair catch. 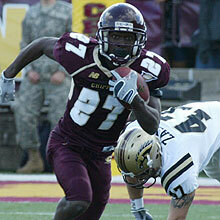 Who were your toughest opponents at Central Michigan? Oh, Michigan State was a tough opponent. Troy was a tough opponent. Arizona was pretty tough. I mean, everybody in the conference was tough. We are the MAC champions, and every time we come out, it’s a battle. It’s football: it’s nothing easy. Every time you come out, everyone’s trying to win, and that’s the main goal in football is to win. Every game we played is tough. No one’s coming out there and just throwing the balls out and just giving it to us easy. I mean, we were the MAC champions two out of my three years, and everybody’s got us circled on their schedule, to give us their best shot. Why do you think the MAC doesn’t get a little more publicity nation-wide? I don’t know. That’s what I’m trying to figure out, because I’m really looking for the answer… This past year I was first-team punt returner All-American. I caught 1,198 yards, another 100-catch season. So, I don’t know. But, you know, publicity is not what it’s about. It’s a team game, and as long as the team wins and we all have a lot of success, that’s what it’s about. Sometimes, with the press, you don’t really need the press, because at the end of the day it’s about winning, as long as we’re here. I’ve got two championship rings, I met with a lot of great people, played with a lot of great teammates, and that’s what it’s all about. I think publicity is overrated, because at the end of the day, it’s about going out and doing your job. Going from the MAC to the combine, what was that like for you? Did you feel comfortable with that, or did you ever get a sense that those guys have a little more exposure than you do, and you felt like you had to do something extra? Not even. I mean, if you watch film, you can see that I’m an elite player. I came from Miami, Florida, and that’s where it kind of leads from, just the confidence and competitiveness. It’s just the nature of football where I come from. Just to be at the combine, I mean, we played against Clemson, I had 250 all-purpose (yards – stats here). We played against Georgia, I probably had 250 all-purpose (stats here). It’s not like I’m an unknown guy; guys know me, and they know what I do. They’ve seen a couple of my games on TV. So, you know, it was a blessing just to be there, but as far as trying to do more… I think I did enough throughout my career. I told you, I caught 305 balls, which is my area code in Miami… So I think the guys pretty much know what I bring to the table. I just went out there (to the combine) regularly as (if it were) a football game and took it as a challenge to show what I could do, and I think that I was really successful. I think I ran really well, and I think I really separated myself from a lot of guys. But as far as being uncomfortable, I was really comfortable after getting a chance to be there. So I think I took advantage of my opportunity. So, 305 is the Miami area code? Were you at 304, and you went up to Dan, and you were like, “Come on, help (me) out”? I mean, I didn’t even count, man. I just make the balls count when they’re going to me. I’m not really counting on my stats, but being that it’s all over and done with, and it’s the past, I can look back on it now and feel really good and thankful. Because that’s a great achievement. I think I’m second in MAC history in career receptions, and I lead the school in career receptions. So I think it’s really good, but my goal is not to count the balls that I catch, I just want to catch everything. I don’t want nothing to touch the ground but my cleats. So, what made Central Michigan stand out to you? I’m sure you had your choice of other schools. What was – what made you want to be a Chippewa? Actually, I went to Central Michigan as a walk-on. I had a lot of big schools (interested), coming from Miami. I had Clemson, Michigan State and a lot of other schools, but I didn’t qualify out of high school. I went to prep school, North Carolina Tech. That’s when I received my test score, and I was getting recruited to go to West Virginia… with (then-assistant) Coach Butch Jones. But I was recruited at Central Michigan (when Jones took the head job). He brought me in at Central Michigan as a walk-on, thinking that I (might not) be up for that, being that I never came to Michigan. So he brought me in as a walk-on, and told me to prove myself, and I took it as a challenge. I had never been up there. I came up there in training camp in August, and I fought, and I earned a scholarship within a week. And it’s been a blessing, man. I’m just proud and thankful that a university took a chance on me and really believed in me, you know what I mean? I gave them all I had. And they know, I just love Chippewas. And I’m a Chippewa. Fire up! When you’re talking to NFL teams, what do you think their perception of you is? I think they love me, man. I think I bring so much value as far as kick returner, punt returner, and my versatility. They like that I play with a chip on my shoulder, and they like that I play with passion. And, you know, they just like what I bring to the table. Special teams is a key in this game. Last year, you had a couple big returns from a lot of the rookies, and I think they look for me to come in and be a special team game-changer, also working as a slot. My (outlook’s) pretty good. They’re seeing me at the combine. They’re seeing me at a pro day. I think they know I’ve got a great pair of hands. I think that I could really be a help to any team, from the slot and from a special-team perspective. What do you think is something they should know about you that they haven’t seen on film or didn’t get to see at the combine? They should know that I’m a competitor. I’m not a guy who was given a golden spoon. I’m a guy that’s going to only get better. I’ve only been playing receiver for about three years. You know, I’m only going to get better. Some guys are already at the top of their game. I mean, (teams) are getting a project, man. A kid who’s really talented and really going to work hard. And he’s going to be a great pro because he’s going to work at it. And a guy who’s still getting better. There’s a lot more things that I can do to better my game in so many aspects… I’m a natural returner, man. I don’t think I ever dropped a punt return in my whole career. So they’re getting a guy who’s talented and a guy who’s displayed so much perseverance and drive and dedication. I mean, a walk-on, having never been at Michigan, a kid from Miami who swallowed his pride and just took a trip and fought for what he wanted. So you had never played receiver before? No, sir. I played receiver one time in high school in an all-star game, and I did really well at it because I always had a good pair of hands, but I actually was a high school quarterback. I didn’t know that. I think that was a pretty good move by Central Michigan. Yes, sir. Central Michigan really helped me. I got two rings from Central Michigan. We just actually won a bowl game, beat another Sun Belt Champion team (Troy). I played really key in that game. I had 400 yards all-purpose. I had a great year, man, and it’s been a blessing that they gave me the opportunity to play, and I gave it all that I had. That’s great. Well, Antonio, I appreciate you talking with us today, and good luck at the end of the month. Thanks Chris, great interview to read and feel some of the fire of Antonio’s passion for the game. I loved his comments about his Special Teams units. He made me miss Wes Welker all over again. Thanks, Box. I thought you might like this one! I think whatever team gets Antonio will end up happy with his production. You really can’t ask for much more than what he did. This kid seems to be a real fighter and scrapper. Would love to see him come to NE with one of our supplemental picks and be a great KR/PR and earn time as a receiver as well. Anyone who catches over 100 balls a year has some hands! The Pittsburgh Steelers selected Antonio Brown in the sixth round, 195th overall.